It’s almost a decade since the global financial crisis created havoc in financial markets. 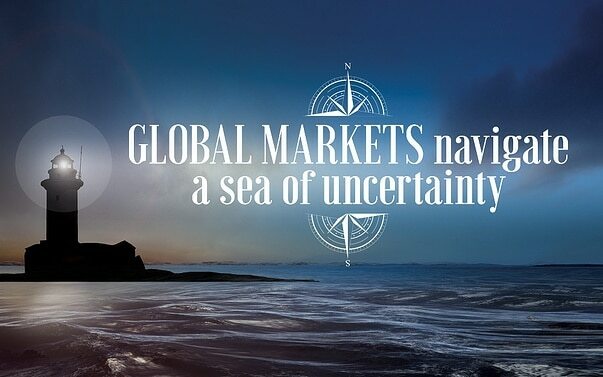 While the global economy continues to show signs of recovery, political uncertainty in Europe and the United States is creating fresh confusion on global markets as investors wait to see how current events play out. It started just over a year ago when Britain voted to leave the European Union. ‘Brexit’ as it became known was followed by the surprise election of President Trump in the United States. Then the relatively unknown and politically unaligned Emmanuel Macron won the French Presidential election. And most recently, UK Prime Minister Theresa May gambled on a general election to strengthen her hand going into the Brexit negotiations with the EU, only to end up with a hung parliament. That’s a lot of unpredictable outcomes for one year. As every investor knows, markets don’t respond well to uncertainty. So what can we expect in the months ahead? Brexit negotiations are finally underway but Britain’s lack of political unity may prolong talks and weaken its hand. The process involves two stages – first there are the technical negotiations over who gets what in the divorce. This will be followed by crucial trade talks about the nature of Britain’s relationship with the EU and its 27 member states going forward. As at April 2017, 47 per cent of the UK’s total exports and 51 per cent of imports were to and from the EU.i UK business leaders are calling for a ‘soft’ Brexit which would allow for the continuation of tariff-free trade in goods and services between Britain and the EU’s 27 members. But some conservatives are pushing for Britain to go it alone, or a ‘hard’ Brexit. Whichever way the talks go, there are likely to be financial winners and losers. The early market response has been to sell down the value of the British pound and British shares, although a weaker pound is good news for companies with foreign earnings. The market has responded more positively to President Macron’s victory and the success of his new party’s candidates in France’s June elections. Macron has promised market-friendly reforms to boost the sluggish French economy. The market’s early positive response to the election of President Trump has lost momentum as key policy changes including tax cuts and infrastructure spending which were intended to boost economic growth now look in doubt. With the focus on political uncertainty on both sides of the Atlantic, the US Federal Reserve’s latest rate rise barely registered on financial markets. The Fed raised its key interest rate for the third time in six months to a range of 1 per cent to 1.25 per cent, with one more rise anticipated this year. This signalled the central bank’s ongoing confidence in the slow but steady economic recovery. Markets appear to be playing a waiting game, with no clear signal to push the US dollar or bond yields higher. After a record-beating run, US shares have held onto their gains but drifted sideways in recent months. The S&P 500 index rose about 18 per cent in the year to June. Closer to home, Australia’s record-breaking economic run continues. While growth slowed to 1.7 per cent in the March quarter as the economy was hit by bad weather, low wages growth and slow consumer spending, it was a far cry from the recession some pundits were predicting. The residential property boom in Sydney and Melbourne is also cooling.iii In the three months to May, Sydney prices were steady while Melbourne prices rose just 0.7 per cent. Prices in Perth, Hobart, Darwin and Canberra fell while Adelaide and Brisbane posted catch-up gains. While this is good news for homebuyers, it also gives the Reserve Bank more room to lower interest rates to stimulate the economy if needed. In recent months, the Aussie dollar has traded in a narrow band around US75c. This is up from its low of US68c in January last year, but longer term the trend is likely to be down as the gap between local and US interest rates closes and foreign money looks for better returns elsewhere. Australian shares have performed well, up more than 11 per cent in the year to June.iv But to put this in perspective, along with the US market rise of 18 per cent, French, German and UK shares rose around 27 per cent, 34 per cent and 22 per cent respectively.v In Asia, the Japanese market has been the standout performer with a rise of 29 per cent. 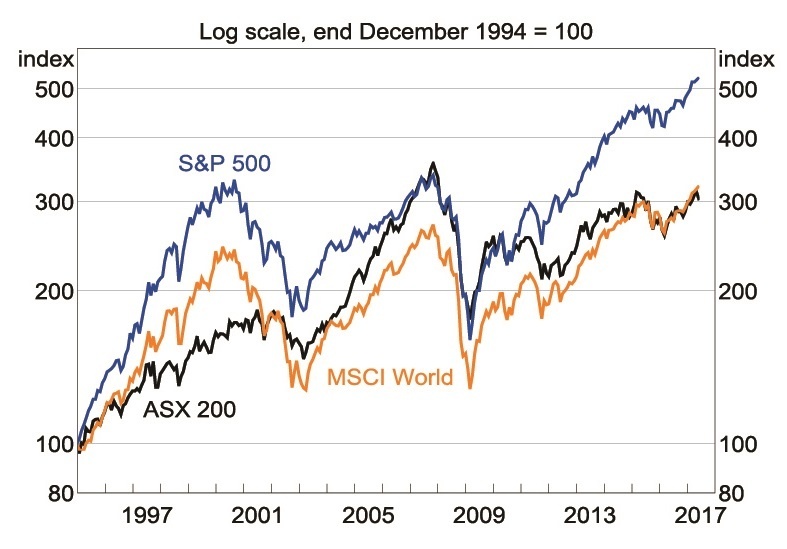 Despite political challenges and uncertainty, global share markets continue to hit new highs while, as the graph shows, local shares are below their pre-GFC peak. For local investors, Australian shares remain attractive for their yields but global shares are likely to continue to provide superior returns going forward. If you would like to discuss your investment strategy in the light of current world political and economic events, don’t hesitate to give us a call. ii All market figures as at June 27.